It's been a while since we've reviewed a pizza. I was in the mood for something hearty, and this looked like the perfect selection, so I yoinked it right out of my Target's freezer. It was the last one in there, so I'm lucky I got there when I did. I wasn't familiar with fennel sausage until I tried this product. It's apparently pretty similar to another kind of sausage that I am familiar with: chorizo. In both taste and texture, the two seem very much alike to me. They both work well as chopped up little dicey chunks, they're both full of spices and flavor, and they both have a similar texture. Of course, the spices in the fennel sausage tend to be European, particularly Italian, and although chorizo has European roots also, the varieties I've tried are full of Latin spices, particularly Mexican. I've never been a big sausage fan, but I find both chorizo and fennel to be palatable. I'll try the wurst from German festivals, but I'm not into the American Jimmy Dean breakfast stuff so much. As far as the pizza was concerned, it was good overall, don't get me wrong. I was just craving more tertiary toppings with this one. The sausage was good. The roasted peppers were fine. But I wanted extra toppings like onions, olives, and jalapenos on this one for some reason. Also, the cheese could have been more prevalent and there could have been a thicker layer of tomato sauce. But that could be said about most AF pizzas. 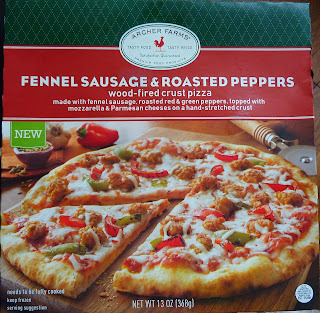 During my little research session, I also learned that fennel sausage is especially appropriate to serve during fall harvest months. Yay! What a happy accident. I love it when I eat foods at the correct time of year. That being said, I should also mention that I've heard rumors of Archer Farms pumpkin products. I shall be hunting these down on my next Target run. Stay tuned for pumpkin reviews! I give this pizza 7 out of 10 stars. I love this (and the WGATJs) blog, and I definitely love pumpkin flavored anything. But as a cautionary tale, you might want to steer clear of the AF pumpkin spice oatmeal. I thought I was in for a blissful treat, but it tasted of raw pumpkin and not much else. Very unappetizing.